Often placemakers and developers talk past one another. Community-based placemakers complain that too many real estate developers build things that lack human scale, ignore or misunderstand the public realm, or displace people and uses that contribute to the public realm more successfully. Developers counter these claims with arguments that many community advocates do nothing but say “no,” or don’t understand the numbers and logistics that a development needs to succeed. As if to bypass this impasse, more and more new developments include a bit of “placefaking”—fancy public spaces that look like placemaking, but have nothing under the hood. They’re all product and no process, all pastel moveable chairs and no community vision or collaboration or accountability. But a recent report from the Brookings Institution puts the spotlight on at least one group of developers that understand the value of placemaking. Earlier this month, the Bass Initiative on Innovation and Placemaking released “Catalytic development: (Re)creating walkable urban places,” a report by Brookings fellow Christopher Leinberger and Tracy Hadden Loh. 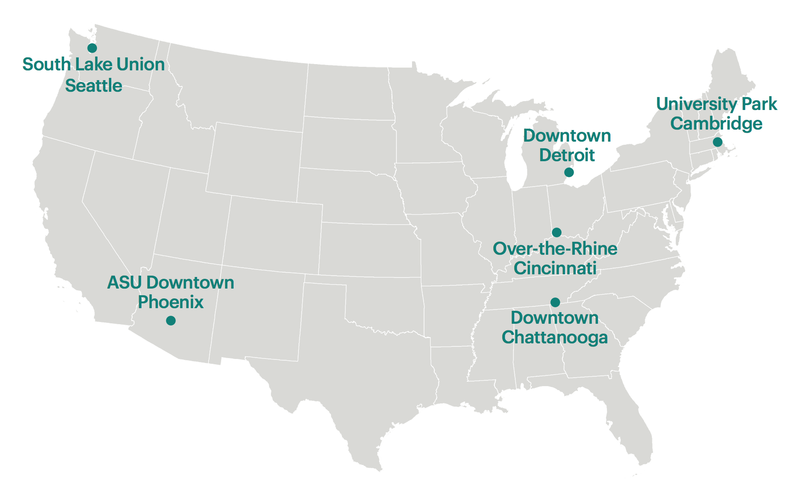 Through six case studies, from Phoenix, AZ to Detroit, MI to Cambridge, MA, the authors highlight a promising new trend in real estate development in which unconventional developers with an attachment to place and a long-term vision are kickstarting the creation of walkable urban places (or "WalkUPs"). The report focuses on six case studies of catalytic developers from around the country from the private, public, and nonprofit sectors. But the capital required for this kind of gradual development rarely comes through traditional financial channels, which seek a quick turnaround. Catalytic developers are in it for the long haul, expecting a return after 5, 10, or even 20 years. To do this they draw upon unconventional sources, like the endowments of universities or other institutions, public funding, philanthropy, private fortunes, or corporations headquartered in the city. Not all of the equity in a development’s “capital stack” must be patient, but Leinberger and Loh found that about 20% is enough to make the shift toward long-term thinking. A catalytic developer is invested in the synergy of uses, people and services in a district—not individual self-contained buildings. This leads them to own multiple, complementary parcels and to take on a variety of “above and beyond” responsibilities, from placemaking to workforce development. Over the long term, suburban development is a vicious financial spiral. Every new development spoils the very reasons the suburb was attractive in the first place, as nature and open space recedes and congestion closes in. Meanwhile, in walkable urban places, the opposite can be true—an “upward spiral” of value creation. Good new development can provide more ground level uses, more foot traffic to feed them, and a more walkable public realm. In this way, a catalytic developer can strategically cultivate a place that's more than the sum of its part, both functionally and financially. The authors also observe that strong place management organizations, like place-based nonprofits or government agencies, Business Improvement Districts or Main Street organizations are crucial to facilitating placemaking, enhancing local business development, developing programs to address pressing social problems, and advocating for improved infrastructure. All of these services help ensure that all the parts work well together and continue to do so over time. 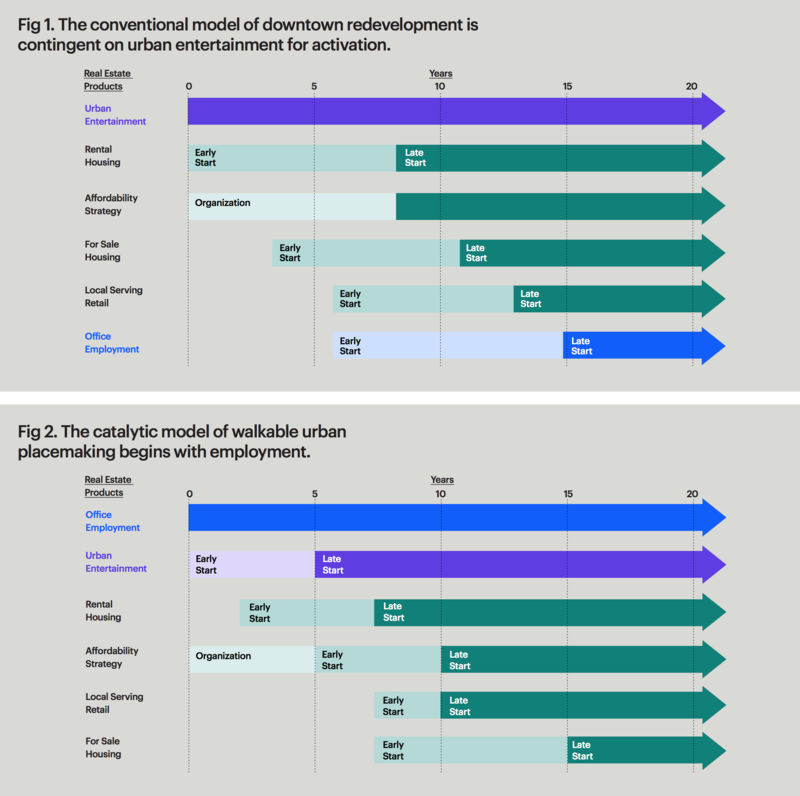 ‍The timeline for catalytic development differs from conventional downtown revitalization, shifting employment from last priority to first and rearranging other investments accordingly. A catalytic developer focuses on retaining and cultivating major employment growth as the anchor for district revitalization. These large employers (or large number of employers), Leinberger and Loh argue, can provide a more stable foundation for urban redevelopment than the tourism and entertainment emphasis embraced by many downtowns. Not every community has this option, but those that do should consider how to best leverage their employment centers as catalysts for placemaking. This map of downtown Detroit shows key investments over time, as well as the properties owned by catalytic developer Rock Ventures. Perhaps no place better embodies this melding of catalytic development and placemaking than downtown Detroit. Like many of the authors' case studies, Detroit’s transformation story started with a crisis. White flight and deindustrialization led to major disinvestment in the inner city, culminating in the municipal bankruptcy of 2012. But in the midst of this slow-motion catastrophe, the downtown provided a hopeful counter narrative. The first item on the report’s timeline of the downtown turnaround is the 2004 renovation of Campus Martius. The year prior, the Detroit 300 Conservancy and Detroit RiverFront Conservancy were founded, signaling a renewed investment in the city’s neglected public spaces. Rather than aiming at blockbuster tourist attractions, as past attempts to revitalize downtown had, these new efforts focused on creating exciting, inclusive gathering places for Detroiters. Project for Public Spaces helped make the park a major local attraction, including concerts, outdoor movies, gardens, a cafe, a fountain, seating, and more. A 2013 pilot project for the Southwest Airlines Heart of the Community program also brought an urban beach to the space, along with a deck, a bar and grill, additional furniture, and programming. Campus Martius became a key factor in the decision of Compuware, a software company, to move its 3,500 employees downtown from a suburban office park into a new building right on the park, reversing the longstanding corporate flight from downtown. Soon after, Quicken Loans followed suit, moving its headquarters downtown. The company’s founder Dan Gilbert, who grew up in and around Detroit, became the city’s “catalytic developer,” acquiring over 90 buildings across 63 acres of the downtown, and bringing 17,000 employees downtown by 2017. Vacancy rates dropped from 21% in 2009, the year before Quicken Loans’ arrival downtown, to under 12% in 2016. As part of a broader downtown placemaking strategy, developed by PPS, the Downtown Detroit Partnership and Gilbert’s Rock Ventures have also made significant improvements to the public realm with more and more active ground-floor uses, facade improvements, outdoor seating, and more. 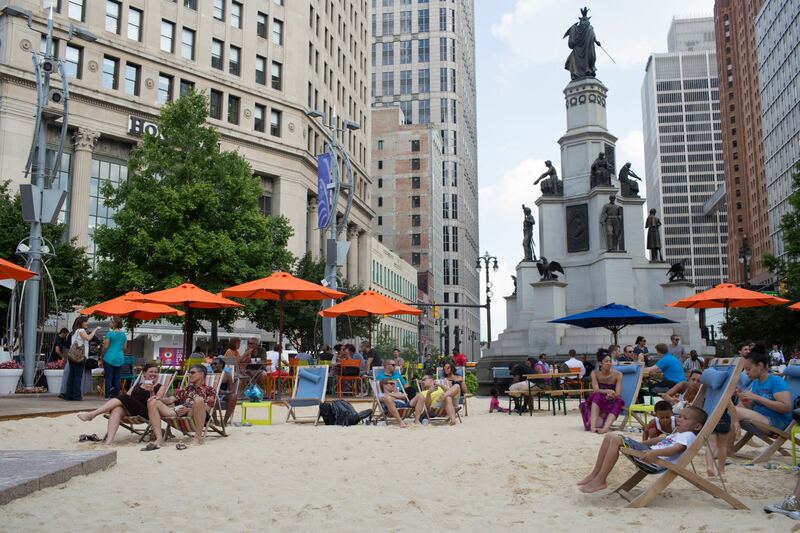 ‍Visitors enjoying the beach at Campus Martius in downtown Detroit. It is the mission of community foundations and the public sector to serve their communities, and it is in the long-term interests of corporate headquarters, anchor institutions, and wealthy individuals to make the cities and towns around them great places to live—though not all of them realize it. But a personal attachment to place on the part of specific people is often the key ingredient that transforms any of these parties into a catalytic developer.